The first of many UK extended play singles by the Beatles to surface in the sixties. While the EP format was never the biggest seller in the United States, where it was mostly used to repackage a handful of songs already available elsewhere on singles or on albums (there were a few exceptions, mostly the early pop musicians like Elvis and so on, who occasionally used it in a mini-album format), it seemed to flourish quite well in the UK, well into the middle of the decade. Usually selecting four recent or thematically-related songs and adorned with the most recent pictures of the group, the label would push these releases out as filler in between singles and albums, mainly to keep their prized bands in the spotlight for as long as they could. 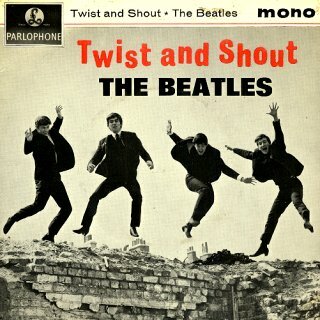 The Twist and Shout EP was no different–four tracks from the Please Please Me album were gathered together to be released while there was a lull between their latest singles, and more so while the band was touring nonstop and playing on all sorts of local television and radio shows. Nowadays that might be considered oversaturation, but at the time it was par for the course if you wanted to be the biggest pop music sensation. The tracks were the big favorite ‘Twist and Shout’ and ‘A Taste of Honey’ on one side, with ‘Do You Want to Know a Secret’ and ‘There’s a Place’ on the other. The choice of tracks is interesting, as it seems that Parlophone focused more on presenting each lead singer and less on theme or flow; we have John’s searing vocal on ‘Twist’, Paul’s vocal on ‘Taste’, George’s on ‘Secret’. Instead of choosing ‘Boys’ for Ringo however, they instead chose the duet of ‘Place’ to showcase their harmonizing abilities. The cover was not by photographer Dezo Hoffman, as is often thought, but by Fiona Adams of Picture Story Publications of Soho. Though it’s a relatively simple picture of the four boys jumping around atop a bombed-out site, it nonetheless became a fan favorite, and one they gave a nod to during the “Can’t Buy Me Love” scene in A Hard Day’s Night. Parlophone would release a handful of Beatles EPs over the next few years, nearly all of them being repackaging of already-released songs (the two exceptions being the Long Tall Sally and Magical Mystery Tour EPs which featured all new songs), and despite that fact, they would all sell incredibly well in the UK. For all anyone knew, this was going to be another pop single by the band that would do reasonably well, just like the previous singles had. It was another ‘pronoun song’ (as Paul and John would refer to them) of their early career, written in a hotel room in Newcastle-Upon-Tyne after a show with Roy Orbison and Gerry & the Pacemakers, another verse-chorus-verse love song they could whip out in the course of a few hours. “From Me to You” and Please Please Me were still doing well, their shows were going over fantastically, and they still wrote new songs during their off hours. It was originally to be a call-response song, but they soon dropped that idea–the only hint of that remaining being the ever-present “yeah yeah yeah” throughout. Little did anyone know how this one track was going to explode all over Britain and catapult them into major stars. If “I Want to Hold Your Hand” is the gateway to Beatlemania in the US, then “She Loves You” was the gateway for it in the UK. It would hit number one everywhere in that country, and become one of their most famous and most loved songs of their early career. There’s a lot that’s different here, too. Unlike their last few singles, which were upbeat yet restrained in nature, they really let things fly fast and loose here. The first thing you hear is the rumble of Ringo’s drum fill–an unexpected opening for a Beatles tune–and immediately everyone dives in with a loud and raucous chorus. And did you catch that on that last “yeah”? That’s a sixth chord! George Harrison, a fine guitarist who loved those “dirty chords” from the beginning, came up with that. Producer George Martin knew those well from his jazz and classical producing jobs, but who in their right minds would put that in a pop song? He felt it was corny and out of date–reminiscent of, say, a Glenn Miller tune. And yet it worked phenomenally. Even the production is interesting–while most of their previous output had been relatively laid back with very few studio tricks used, with this song everything is pumped up to the fore, as if frantically trying to capture the overwhelming power of the song itself. High drums, high guitar (with fantastic jazzy fills from George), and extremely strong harmonized vocals from John, Paul and George. There’s slight use of reverb here as well, giving it a bit of an echo. They used the production style itself as part of the overall structure of the song, something they would fast become known for. And the ending! Wow, the ending…no final chorus, no final words…just a jubilant “yeah yeah yeah!” It’s you finally taking your best bud’s words to heart and running out that door to find your girl again. This is what sold the song for everyone–it’s an explosion of excitement and positive feeling. One can only wonder what the kids of the day felt when they heard that for the first time. The band was already proving themselves as a perfect outlet for adolescent frustration and reckless abandon out of the view of the parents and elders, and this song was the band saying “go on, go for it. Don’t hold back.” And that last sixth-chord a capella “yeah” at the end of the song would become a quintessential Beatle trademark, and probably one of the first “Beatlesque” composition points that would be copied, revered and imitated for decades to come. And so Beatlemania was born. This is one of those songs vastly overshadowed by everything else surrounding it–the enormous fame brought by its much stronger flipside track, the never-ending appearances on the radio, TV and stage, and the hit singles and albums that came before and after. And for the moment, let’s even look past the present-day view of the lyrics as maybe sounding a bit stalker-ish. This is a typical b-side for the band, one that might not have been as exciting or heartfelt as the main track, but was most definitely not a forgettable throwaway. Unlike the bombast of the a-side, this track is mixed tight and clean. No instruments take precedence here–George’s guitar is relegated to second rhythm to complement John’s, Paul’s bass playing is smooth but not that adventurous, and Ringo’s drums are steady and plain. Part of it is due to it being in mono (along with the a-side; both tracks were two of four Beatle tracks never released in true stereo), but it also seems like it was done purposely. 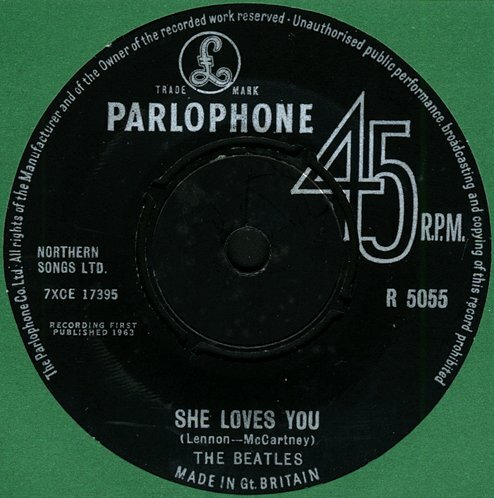 Unlike the emotional abandon of “She Loves You”, “I’ll Get You” is a straight-ahead song about a man trying to woo a reluctant woman. There’s even the repeated refrain “Oh yeah, oh yeah” that seems to have been lifted from the other side. And if you notice about halfway through, Paul screws up the “when I’m going to change your mind” line by singing “make” instead, which was never fixed. And if we left it at that, it would truly be an uninspiring afterthought of a song. Of course, this being the Beatles, they couldn’t just let it go a that. For starters, there’s John’s first of many uses in a lyric of a request for the listener to think about what he’s about to say: Imagine I’m in love with you / it’s easy ’cause I know / I’ve imagined I’m in love with you / many many many times before. [Not to mention that when sung in a Scouse accent, the words “know” and “before” actually do rhyme!] There’s also quite a few interesting chord changes here, ones placed far enough back in the mix that you don’t immediately notice them. You kind of expect it to be a typical I-IV-V blues format, until it gets to the it’s not like me to pretend section at the end of the verse, where they execute a rather busy D-Am-D-Bm-G-A run, followed by a simple G-D-E-A bridge and back into the song. And as for that one lyrical flub…this might have been the first time a wrong word was delivered in a Beatle song, but it would be far from the last, and more often than not, they left it in on purpose…they often reveled in throwing little odd bits into their songs just to see who noticed. Overall, it’s not their most memorable song, but as said, they rarely if ever threw away a composition or did a job half-assed. Even a song like “I’ll Get You” is treated with time and care by the band. If their previous songs were any indication of what was expected of the band, then nobody had expected “She Loves You” to be miles ahead of what they’d previously put out over the last year. It even woke up some of the listeners stateside. Capitol Records, in their infinite wisdom, still didn’t think the band was worth signing, and the single was relegated to the minor label Swan Records and released about a month later in September. [As an aside, Brian Epstein learned from his mistake with Vee Jay and stated that Swan could only hold it for two years, and only that single. By that time he’d expected that Capitol would soon come around, and this would keep any additional legal hurdles at bay.] It didn’t make that much noise here in the US, but there was a significant amount of chatter going on by this time. Influential New York deejay Murray the K was a big fan of it, and the Vee Jay versions of their first singles were starting to sell. It might not have gotten all that much airplay or sold much at all, but it was just enough of a primer to prick up the ears of potential listeners. By the end of 1963, Capitol would finally get the hint, and nothing would ever be the same. The spring of 1963 was a ridiculously busy time for the Beatles. After their marathon session in February to record the remaining ten tracks off Please Please Me, they left it in George Martin’s capable hands to produce the mono and stereo masters for release. Meanwhile, they would be crisscrossing all over Britain on tour. Many of these shows had been arranged by Brian Epstein well before they became famous, so even though they’d suddenly had hit singles and a new album racing up the charts, they were still honoring these tiny shows at hotel ballrooms, local cinemas, and even a few schools! In addition to this, they also honored a few of their scheduled shows at the Cavern Club, played a number of BBC radio programs (thus the wealth of “at the Beeb” recordings available), occasional showcases with other Epstein acts like Billy J Kramer and Gerry and the Pacemakers, and an ongoing tour with Helen Shapiro. And in between all of this, they made time to record more singles and a second album. It was on 28 February while they were riding on a coach for the Shapiro tour that John and Paul holed themselves up in the rear of the bus and worked on writing a follow-up single. It’s said that Kenny Lynch–the man who’d recorded “Misery” as the first person to ever cover a Beatles tune–had heard them singing the “ooh” in the middle eight, and immediately thought the song was doomed to failure. Five days later they were back in Studio Two at Abbey Road, and banged out “From Me to You”. And despite Lynch’s misgivings, it would end up being their second single to hit number one. The b-side, “Thank You Girl”, was most likely written around the same time. These two tracks, as well as a long-unreleased version of their song “The One After 909” were recorded on 5 March (a fourth song, a version of “What Goes On”, was practiced but never recorded). The single was released a month later. Despite Kenny Lynch’s disdain for such a simply-written song, it’s a very catchy tune, and understandably caught the ear of thousands of teenage fans. Playing on the personal “me and you” that worked so well with “Please Please Me”, this love song played on the fact that John and Paul were well aware of their female fans that felt they were singing just to them! The lyrics are light and fun, as if they just want to gush over their sweetheart–if there’s anything she wants, he’ll take care of it, because they love her that much. There’s also a return of the theme of distance, the couple being separated but their love remaining strong and true. There are quite a few interesting bits to this song, really. Right off, we have John and Paul scatting the opening melody, the “da-da-dah da-dun dah-dah-dah”. That was Martin’s suggestion (which the band thought was rather odd, until they heard the final run through and agreed it actually worked). What’s also interesting is that the main verses of the song also serve as a repeating chorus, with the title right at the end of each verse–“just call on me, and I’ll send it along, with love from me to you.” The bridges are similar, repeated after each verse section. There’s also the solo section, understated yet creatively done: George repeats the verse melody on the guitar, while John echoes it in a higher octave on harmonica and also fills in an echoing of the title [da-da-dum da-da-dum-dum-dah (“from me…”), da-da-daum- da-da-dum-dum-dah (“…to you…”)] before singing the last part of the verse. Overall, it’s a giant step up from their previous songwriting–by this time, they had a few singles, an album, and a ridiculous amount of touring under their belt, not to mention at least five years’ worth of working on their craft. This was the song that clicked with them, one that wasn’t a throwaway but a well-crafted one they devoted time and work to. That pretty much explains that song in a nutshell–it might be yet another love song they could write in their sleep, but it was one that the fans could take as a personal note just to them. On the surface, it’s another of their head-over-heels love song lyrics, and musically it’s extremely simple. John later said he wasn’t exactly impressed with how it came out, feeling it was close but missed its mark. Simply put, it’s a song about a man eternally grateful about the woman he loves. But as Paul hinted, there was an ulterior motive: taken from a besotted fan’s perspective, this is a heartfelt “thank you” to all the female fans out there who sent them countless fan letters and screamed at their concerts. So soon into their professional career as musicians, they felt themselves truly lucky and grateful that these fans were so dedicated. This was actually supposed to be the A-side, but after recording the two, it was decided this would be the b-side. Like “Ask Me Why”, it ended up not being one of their stronger songs, but it was no throwaway, and it the fans themselves were of course happy to have such a song written for them by their favorite band. This was another single released on the VeeJay label in the US, as Capitol still hadn’t gotten on board at this time. “Thank You Girl” was added as a replacement track on later reissues of Introducing the Beatles and later on the US release The Beatles’ Second Album, and “From Me to You” would pop up on a version of Songs, Pictures and Stories of the Beatles (one of the many VeeJay reissues of Please Please Me under various titles), but other than that, neither track would get a straightforward release on an album together until the cd release of Past Masters in 1987. It was unfortunately a missed opportunity due to the legal wrangling between VeeJay and Capitol at the time. The third track recorded during this session, “The One After 909”, would be all but forgotten until January 1969 when it resurfaced during the Get Back album and movie sessions, but by that time its format was drastically different. Instead of a mid-tempo rock and roll tune emulating Chuck Berry, it ended up countrified and sloppily recorded as an afterthought and released on Let It Be. It very nearly surfaced in 1985 on an aborted compilation of unreleased tracks called Sessions, but wouldn’t get an official release until the Anthology 1 album in 1995.